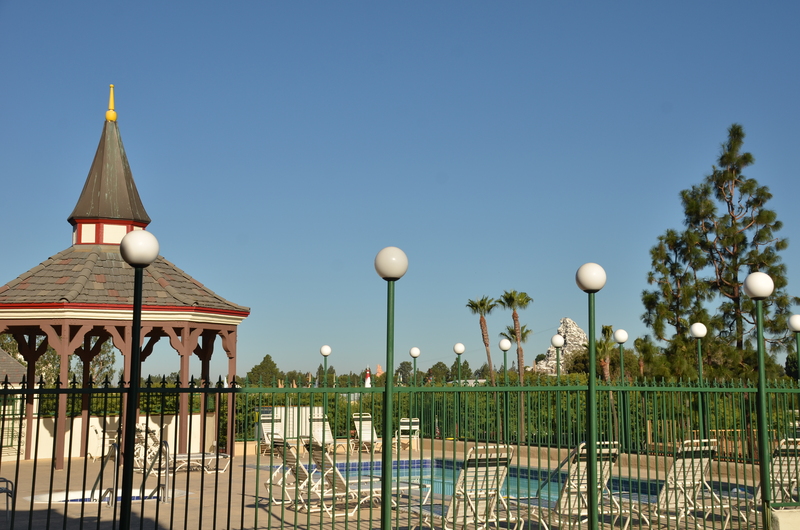 Camelot Inn and Suites is Disneyland Good Neighbor Hotel that is about a 5-minute walk to Disneyland. We recently stayed at this hotel and thought it was perfectly suitable for our needs. 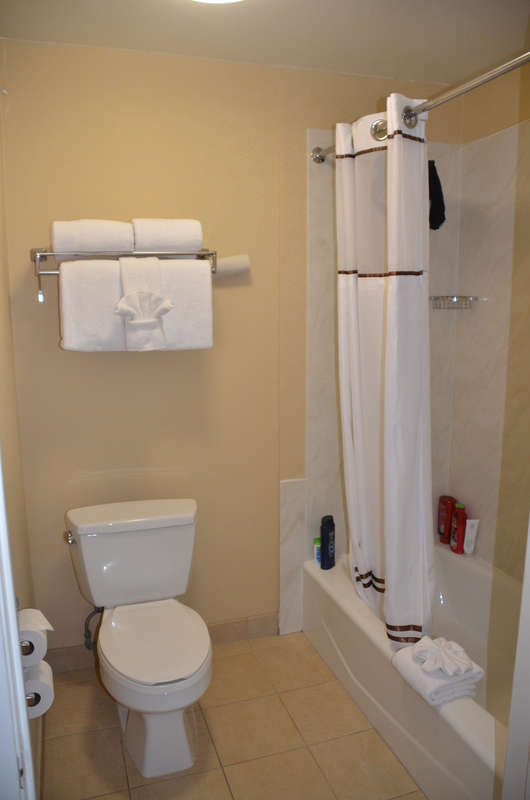 In this review, we’ll cover the rooms, amenities and location of Camelot Inn and Suites. If you’ve ever driven near Disneyland you may recognize this hotel as ‘the one that looks like a castle’. Well, technically there are a few hotels that technically look like castles near Disneyland. (The Castle Inn & Suites being the most castle-like.) Of those hotels, Camelot Inn & Suites is the closest to the Disneyland Esplanade. I might as well start off this review with the biggest positive of staying at the Camelot, it’s without a doubt the location. As you can see in the map below (thanks Google! 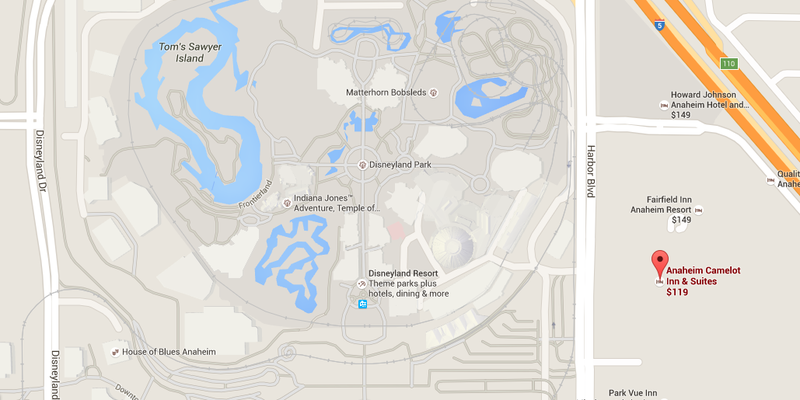 ), the hotel is directly across the street from the parks. As you can see from that extremely professional screenshot, there are quite a few hotels on Harbor Boulevard. Actually there are way more hotels than that screenshot shows. I’ve got to get better at screenshots… A decade ago, those hotels (actually most of them are motels) were all pretty unpleasant places to stay. Once California Adventure became a viable park and started attracting many tourists to the Disneyland Resort, all of these Harbor Blvd. motels stepped up their game. Still, many of these motels are nothing but a room to sleep in. Camelot Inn & Suites fits that mold, for the most part. There are no restaurants inside the motel (McDonald’s, Cold Stone and a few others are really close by), and no workout room. The pool and hot tub are both very small, although they do offer a fine view of the parks and fireworks. The deck area where the pool lies is pretty large (making me question why the pool and hot tub aren’t a bit bigger) and nice to soak in some sun on. There are coin-operated laundry machines and complimentary computer access in the lobby if you need either service. There is also a small gift shop near the lobby, although it’s not much to write home about. I mean, you’re at Disneyland why would you write home about a small gift-shop at your motel? Speaking of the lobby, there isn’t anything too exciting about it. It’s a quaint little area that matches the theme on the outside (a castle) moderately well, but the area wasn’t extremely inviting or warm. There’s limited furniture but what was in there did look comfortable. The lobby is like the rest of the amenities, not enough reason to convince guests to stay or not stay there. Of course, as I’ve said, the hotel does have a certain castle look to it. To some, this might be important. 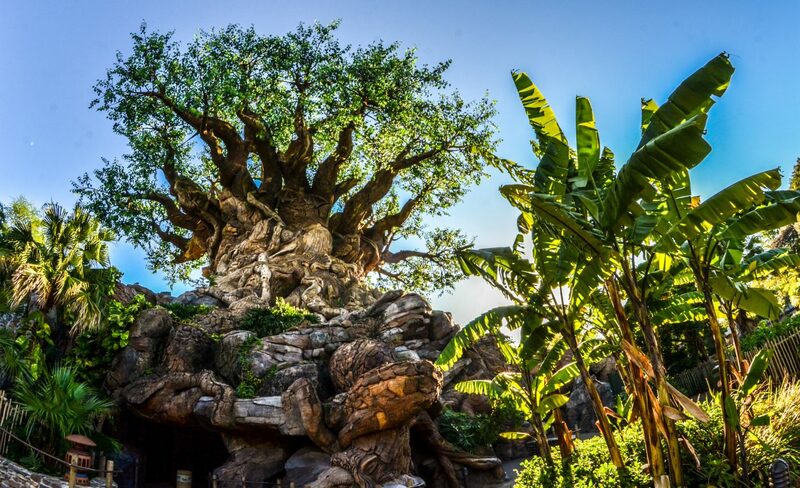 If you want to keep the magic going for a young child while on a Disney trip, returning from the parks to sleep in a castle might make the trip extra special. I’ve heard that if you ask politely, the lobby staff will give a lovely rendition of ‘Knights of the Round Table’ from Monty Python and the Holy Grail. Naturally, you have to tell them your name, your quest and the air-speed velocity of unladen swallow first. Back on track… While the outside looks like an older castle, past the lobby Camelot Inn & Suites looks like a standard motel. Not that there’s anything wrong with that. Let’s get to the room! Now, so far the motel hasn’t been anything remarkable and the room is going to continue that trend. I did enjoy the size of the room. We stayed in a Deluxe King Room. The king bed was comfortable and we both liked the mattress pretty well. I also liked the couch in the room pretty well and found it comfortable enough. The couch gave the room a little extra space. There was a chair by the window, although I don’t recall ever sitting in it. With the bed being closer to the bathroom, there was quite a bit of open floor space when first walking in to the room. Judging by photos on the website, the room with 2 queens has chairs by the window of the room and no couch. Sorry about the slight mess in the room, I forgot to take photos the first day we were there and we were in a hurry once I finally remembered. As you can see, the colors are fairly bland. I like the rich tone of the headboard but everything else was pretty dull and just kind of thrown-in. Still, I didn’t think it was anything bad or obscene. Again, sorry for the mess. 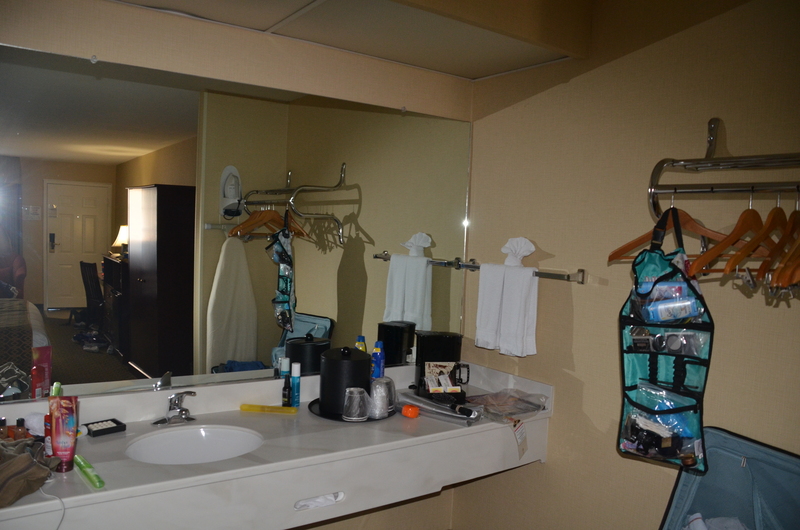 The sink area was very standard and out in the room instead of in the bathroom, which I prefer. There was plenty of space to move around and the counter was quite large, as you can see from all of the stuff we piled on it. The TV was an average size (I believe the motel website said they were 36″) but again, you probably won’t watch much TV if you’re on a Disneyland vacation. There was a desk, in case you have to put in some work. The bathroom was bland but pretty standard for a motel. I wish all hotels would invest more in bathrooms. This one had a tub/shower combo and a toilet. There’s a fine amount of room and was clean. To be honest, I’ve probably undersold the motel just based on how clean it was. We really liked our room compared to where we stayed before this (Howard Johnson) and it was mainly because of the cleanliness and size. 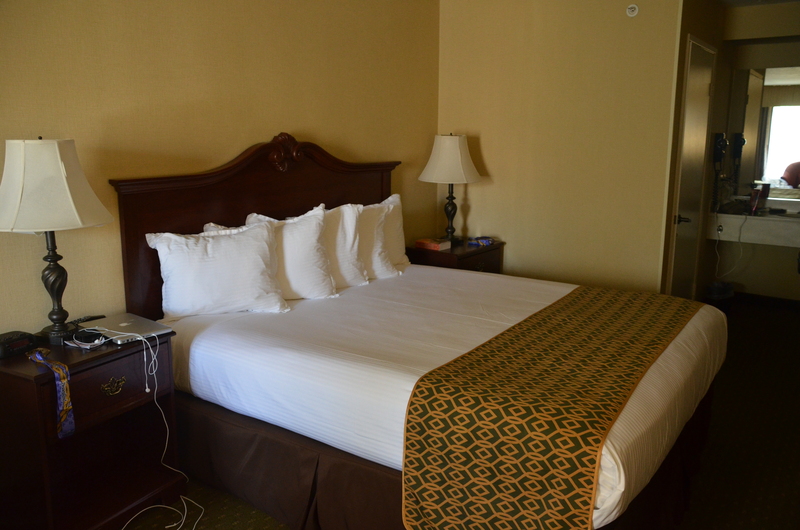 The room was also fairly quiet, aside from when the Disneyland fireworks were going off. We went to bed early one night, as we were running the 10K the next day and the fireworks were very loud as they were right across the street. But any other time of the night was quiet. I would ask for a room in the middle of the motel, as it’s further from the freeway, road, and Disneyland. Another aspect of the hotel that might appeal to some is the family suites. This room sleeps 6 according to the website, although I think you could fit 7 or 8. There is a king bed, 2 queens and a sofa bed. Unfortunately, there is only 1 bathroom. Still, for a family looking for extra space that is still a value this is a pretty good option. Let’s talk prices! The hotel usually runs between $120-$150 for the standard room. The family suite usually comes in at $230. There is $12 fee for parking and a pretty high motel tax. Camelot Inn & Suites is regularly on Hotel Tonight, which is an app that offers hotels if you are booking at the last minute. It shows up on there for between $100-$130. If you find a stay at the Camelot for under $130, I think that is a pretty good deal. Overall, Camelot Inn & Suites is a decent motel at Disneyland. While the amenities probably won’t wow you, the location beats out most high-end amenities other hotels would offer. If you are looking for a place that is simply just for sleeping and not much more, the Camelot is a great choice if you can find it under $120, and a decent choice if you can find it under $140. If you are looking for a place that your family might spend a little more time at, I would recommend looking elsewhere (although the options are much more limited. The family suites are unique around that area and may suit guests with bigger groups well. 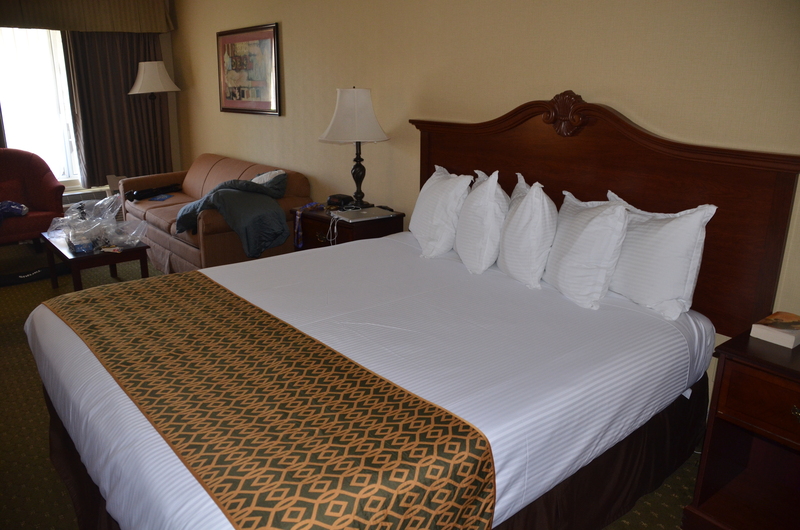 We had a good stay at Camelot Inn & Suites and I would happily recommend it to anyone. If you have any questions for me or experiences at any hotels around Disneyland, please leave them in the comments! Thank you for reading! Is Disney’s Hollywood Studios Worth Going To In 2016?